By now, you should be pretty aware of my love for eggplants. Yes, that spongy, rich dark purple vegetable that is like a culinary canvas waiting to absorb any spice you throw at it. I first discovered this recipe on a vacation visit to Trinidad, during my stay in Colombia. 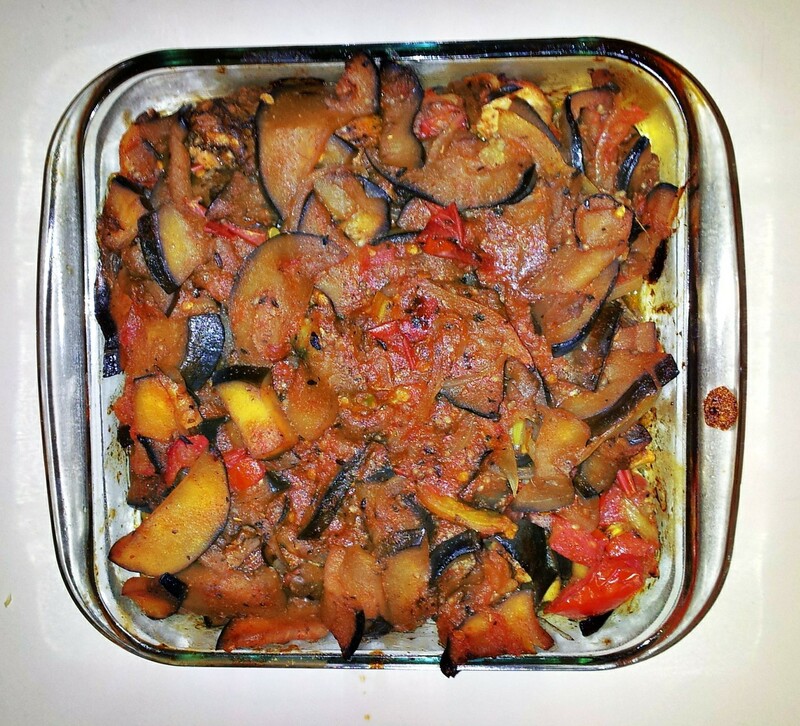 This has since then gone down in my books as one of my favourite applications of eggplants in a non-vegetarian dish. I urge you to try this recipe, even if you are totally opposed to (afraid of?) eggplants. I promise you your taste buds will thank you. Place sliced eggplants in a colander. Sprinkle liberally with salt and let stand for at least an hour (see my previous post on this process). Bake chicken in a casserole dish (uncovered) at 360°F for 40 minutes. Set aside. Rinse eggplants thoroughly to remove excess salt, and drain. Sauté with onion, garlic, tomato, scotch bonnet pepper, bell pepper, dried herbs and spices. Add broth/stock and bring to a boil. Adjust salt as needed. Reduce heat and let simmer for 8-10 minutes. Add sugar at the last 2 minutes and stir to combine. Pour mixture over chicken and return to oven and bake at 360°F for 10 minutes. Cook for an additional 3 minutes under high broil. As for seasoning the chicken, here’s what I used: onion, garlic, thyme, cumin powder (geera), black pepper, paprika, Maggi All Purpose seasoning (one of my faves!). Refrigerate to marinate for at least one hour. Overnight is always better. Remove from refrigerator 15 minutes prior to baking to bring to room temperature. A quick tip: At the last 2 minutes or so during simmering the eggplants, I drain the excess drippings from the chicken and allow the eggplants to soak up all this goodness. So, what do you eat this with? My personal faves are roti (indian flat bread – whole wheat, of course), or brown jasmine rice. What would you pair this with? 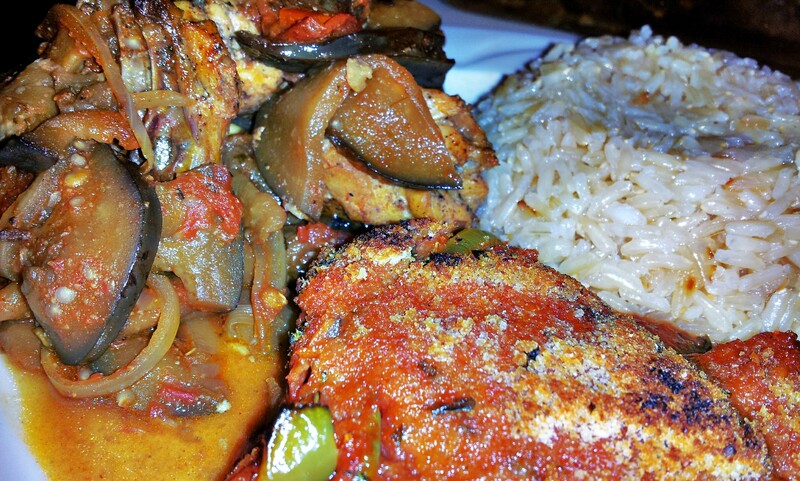 This entry was posted in Food, homemade, Uncategorized and tagged chicken, eggplant, homemade. Bookmark the permalink. I’m a lover of eggplant also. This is going down in my “have-to-try” recipes…. I’m happy to meet another eggplant lover! #fistpump lol. You will love this dish, Jody. Let me know how it goes. this was very good. i will def try this at the end of march. Thanks Corve. Do let me know how it turns out. you could pair it with some yam and bananas. 🙂 right? Of course! That would make it even more hearty and filling. May I suggest also pumpkin and sweet potatoes. i absolutely love the plating of this!!!!!! !